Chino, California – September 27th, 2011 - Cooler Master, an industry leading chassis, thermal solution, peripheral, and accessory manufacturer, signals the rebirth of a household name in computing, the Hyper 212 EVO CPU Cooler. It comes packed with an improved tower fin design, heat pipe layout, and upgraded fans and fan brackets that provide an even more extreme value for end-users of all types. The cooling system has been redesigned and optimized to provide the best user experience and cooling potential for a new generation of processors. Four Cooler Master patented Continuous Direct Contact™ (CDC) heat pipes are tightly packed into a flat array on the CPU Cooler base. This acts as a virtual vapor chamber that dissipates a large amount of heat. The aluminum fin structure has been optimized to provide the perfect performance balance between high and low speed fan operations. 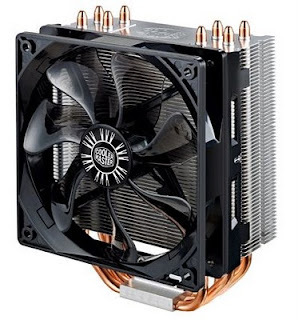 A high performance 120mm PWM fan with anti-vibration rubber pads and a quick-snap bracket is included. An extra set of quick-snap brackets and anti-vibration rubber pads come standard to give users the option of enabling even greater cooling performance by adding another 120mm fan. The brackets make changing, adding, and cleaning fans an easy task that requires only a few seconds. The included PWM fan can be adjusted via BIOS or OS-based motherboard tuning applications. There is no need to choose between overclocking performance or stock stability, the Hyper 212 EVO and included PWM fan are a versatile pair that tailor noise and performance to any need. In Nov. 2011 Intel will be launching their LGA 2011 socket. Cooler Master will offer one free LGA 2011 bracket to those who purchase the Hyper 212 EVO before the inclusion of this bracket in the Hyper 212 EVO packaging. Find the new legend, the Hyper 212 EVO, at online and retail locations that sell your favorite Cooler Master, CM Storm, and Choiix products. It will be available for $34.99 in September, 2011. Cooler Master was founded to provide the best thermal solutions to our customers worldwide. Since its establishment a decade ago, we continue to invest in product development in order to provide leading-edge innovations to people and businesses. Cooler Master’s enclosure technology line-up includes heat sinks and fans, chassis, power supplies, function panels and accessories. Cooler Master has its headquarters in Taipei, Taiwan, with global branch offices located in Europe, America and APAC, so that we can offer to our customers the best service in time. For more information on Cooler Master, please visit www.coolermaster.com.